So, I decided to start off my healthy eating series with a simple salad. What got me started on this was a meme I happened to see on Facebook. It actually pissed me off. This was not the exact meme I saw. The one I saw said “Why are poor people fat?” So, I started thinking about this. There is so much wrong with this, yet it holds true at most fast food restaurants. 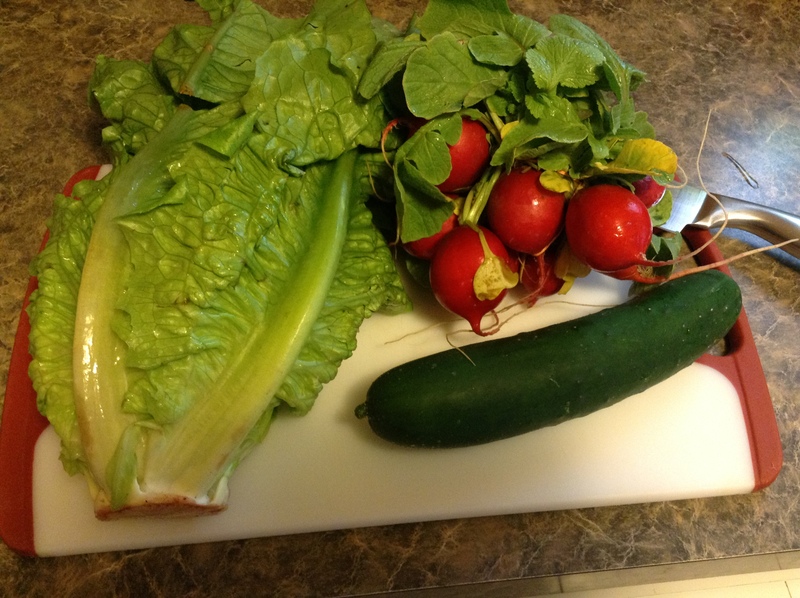 So, I conducted a home experiment to find out how much a salad should cost. Now, this price will go up or down depending on what you put in. I like artichokes and feta in my salads, also, so this will go up due to that. Your choice of lettuce will also change the price. I could have gone with Iceberg for .99, but Romaine has a higher nutritional yield than most leafy greens (here is one chart and here is another). It’s worth the extra $0.50. 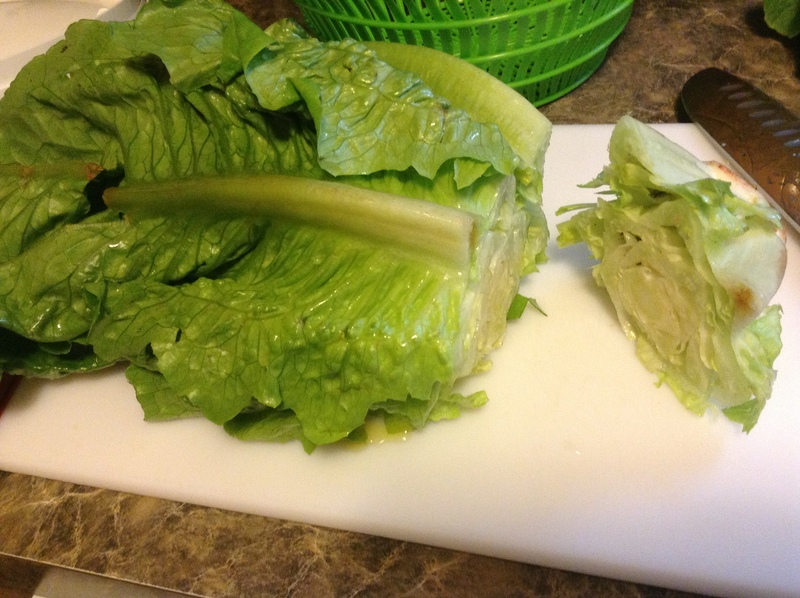 So, I chopped up my lettuce. I used a knife in this instance. 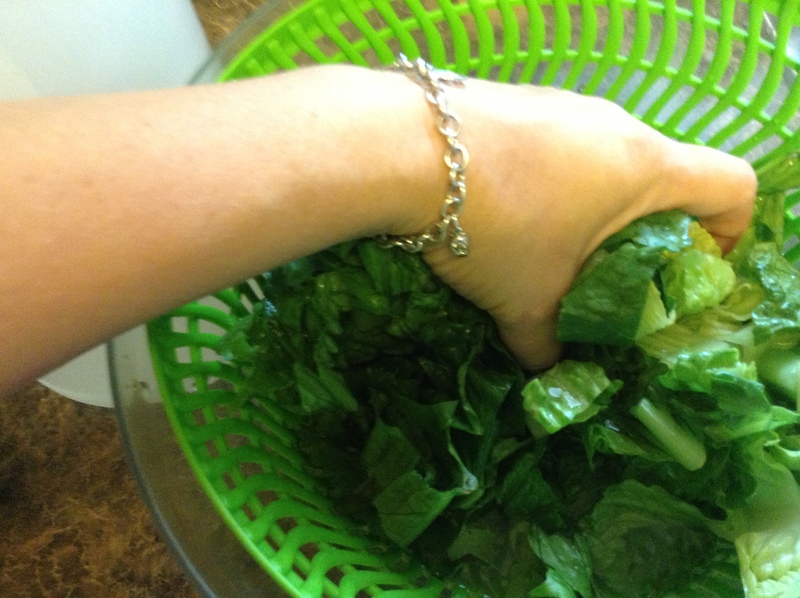 It will stay fresher for longer if you rip it up by hand or take off however many leaves you want. I wanted to get an accurate measurement so I could post an accurate price. 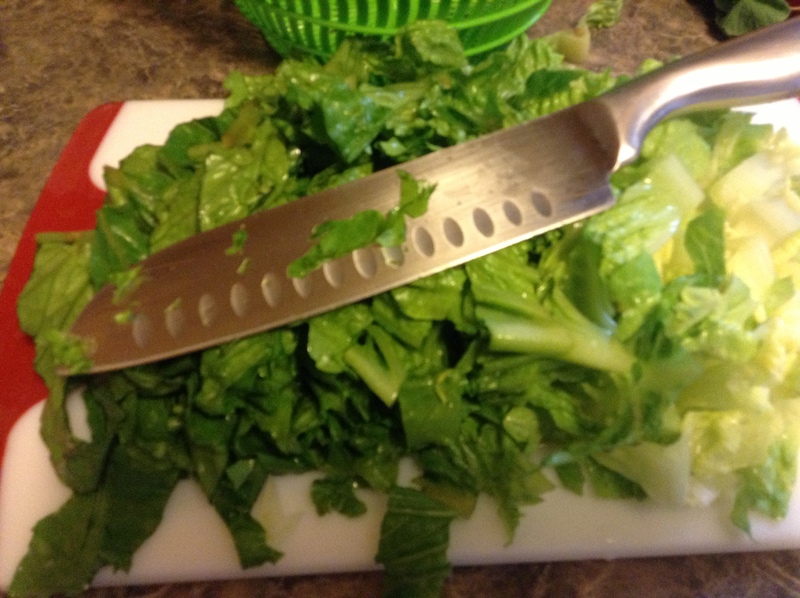 I do have a trick to preserving my cut up lettuce. I rinse it in a bit of vinegar. It stays crisper and prettier for a few days longer. 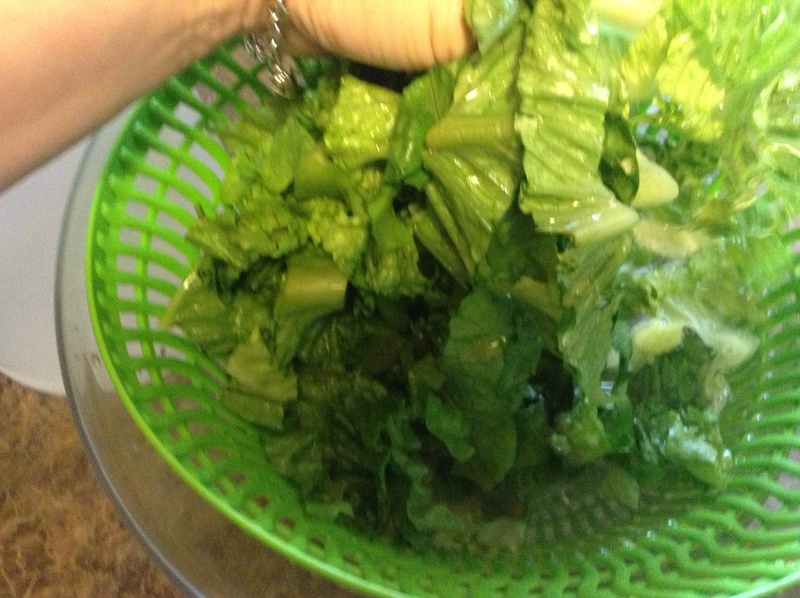 Once I chopped it up, rinsed it, and spun it in my salad spinner (I love this gadget), I measured it out. 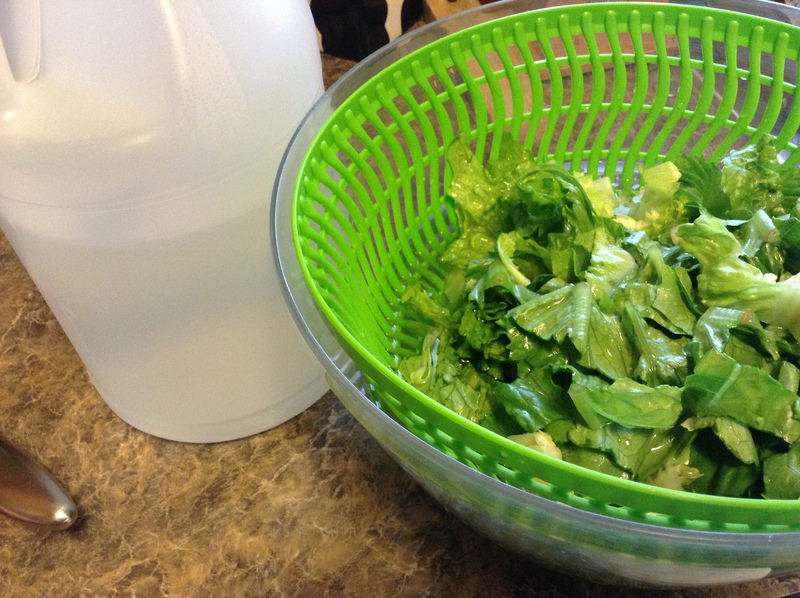 I came up with 5 1/2 cups of lettuce. 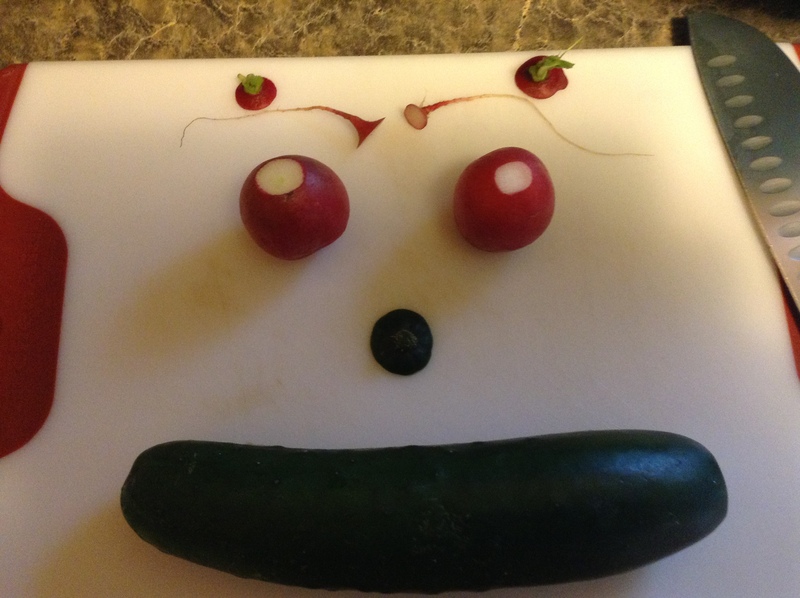 I sliced up 1/4 of the cucumber and one radish (the bunch had 10 radishes). 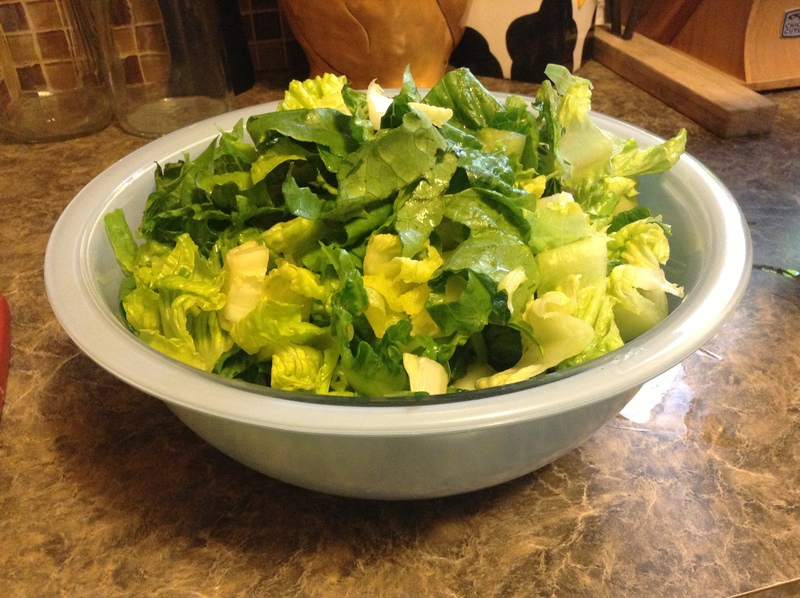 I put 2 cups of lettuce into a bowl (splurge! 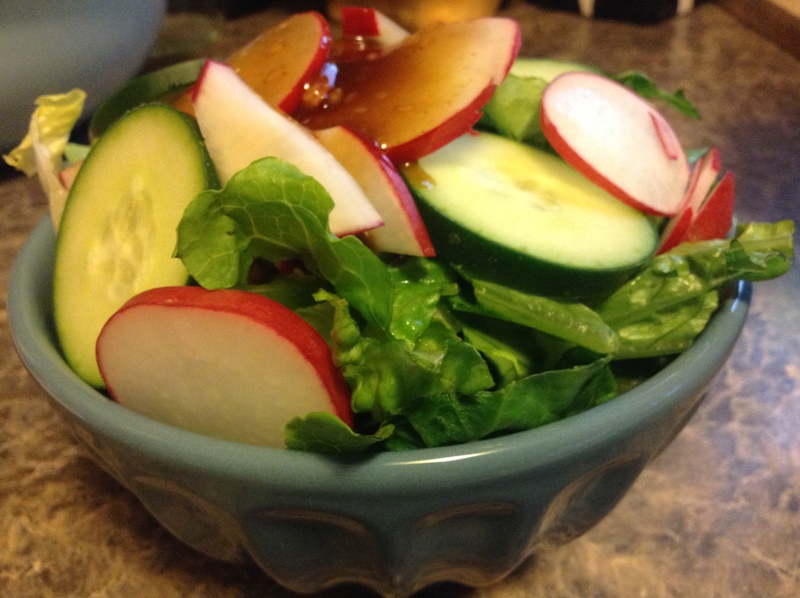 1 cup = 1 serving), piled on the cucumber and radish slices, then poured on 2 tablespoons of dressing. Yes. Less than that burger in the meme. And because I used TWO CUPS of lettuce, this was actually two servings of salad. I would recommend adding in some sort of protein (cheese, chicken, chickpeas, pumpkin seeds) to get the full nutritional benefit from your salad. 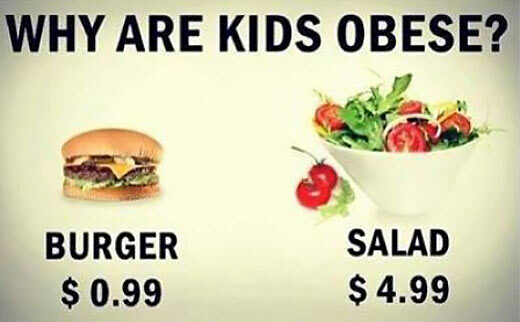 I came across your page when doing a photo search for a school report on the link between obesity and poverty, and I agree with your point about how much a salad “should” cost. But I want to gently suggest that your position, while valid (and yes, the photo is angering) is a little more convoluted that it is on this surface. What this photo implies is the economic situation of the person who is making this choice is likely such that they would lack the luxuries of time and energy to make such a meal for themselves. That often, the poor frequent these restaurants (if we can call them that) because they are fast, convenient, and less of a sacrifice economically. Not because of how much the food costs, but because the loss of time working or meeting other obligations costs much more to them. Put simply, if you’re a mom working two or three jobs to pay rent and bills and raise a couple kids, it’s not likely you have the time or the inclination to make a nice meal for yourself every day. While I appreciate your point about the straight cost-comparison, I believe the onus is on the fast food companies to reflect the real pricing here, and not on the person in the situation of making a choice like that. Thank you for your contribution! Cheers. Thanks for the suggestion. And I really do understand not having time to prep meals. I have four kids of my own, which means little spending money and little time on my own to cook nice meals all the time. We are a one income family as daycare costs would have just taken any paycheck I would have brought home. I am blessed to have a lot of family in my area who can help watch my kids if I do want to have a “prep day” or even a shower by myself. Part of the reason I created this post was to show that there is no reason for salads to be so much more expensive. Now, the salads that are served at fast food places are not always the best for anyone (just like their burgers or fries). They give out massive amounts of dressing, which add a ton of calories and fats. They often offer “crispy” or “grilled” chicken, then give too much of either one. The chicken alone is actually enough for one meal. Adding all of that dressing plus probably candied nuts or dried fruit, you have just totally undone what might have been a healthy option. This is just something that a lot of folks don’t think about. You don’t need to eat all of that chicken. You don’t need to add on all of that dressing or the extra stuff. For that matter, restaurants don’t need to serve them up with all of that, either. Huh. I should add this to the post.